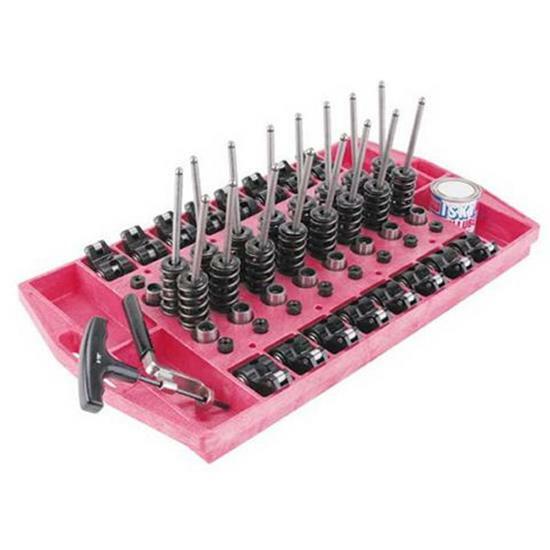 This tray allows you to keep your valve train components organized and mated during assembly or disassembly. Lightweight plastic tray features individual compartments that allow you to store rocker arms, pushrods, valve springs and most other valve train items. 23-1/4" x 12-3/8" x 1-5/8"
What happens when you advance or retard a camshaft? In this tech article, we explain the pros and cons of installing your cam straight up, advancing or retarding. Learn the basics to engine performance like; how does a cam work? What is Valve lift, duration, lobe separation angle, and cam profiles? Afterwords selecting the right camshaft will be less of a guessing game! Zach bent an exhaust valve and needed to pull the top off of the engine to replace the valve and gaskets. There are several reasons why you would need to pull the top off of your engine, but Zach's step by step process is universal. Speedway Motors Street Tech Kevin recently installed a Gear Drive on the 454 destined for his '54 Belair. To get the longest life and most performance out of your engine, it's important to have the valve lash set correctly. Here we show you how to set valve lash on a small block Chevy using a hydraulic lift camshaft. Picking a proper camshaft for your project can rapidly deteriorate into chaos. So many possibilities. Want a little advice? Click here!